Trade shows remain a great way to show off your products and talk face-to-face to potential clients, but the trade shows of today are not your father’s tradeshow. In the “old days,” starting in the 60s, you might place a few products on a table, hand out some literature, hope to engage in conversation, and get a business card so you could follow-up. The goal of getting leads might be the same today, but the process is conducted in a very different atmosphere, characterized by interactive displays that are bright and eye-catching. 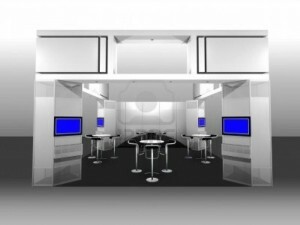 Current trade show trends for 2013 reflect today’s fast paced culture and how people process information using technology. We live in a world of sound bytes, where people are attracted to products through catchy slogans, compelling graphics, and quick videos. Modern tradeshows play on these trends by depending less on the custom-built displays of the past and more on minimal displays with high-tech lighting and easily changeable banners. Even major exhibitors, whose booth occupies an area equivalent to a city block, count on the “wow” factor to woo visitors. As an exhibitor, you must be friendly and show a willingness to engage, but interactive technology is now what gets people into the booth and promotes conversation. Touchscreen displays allow visitors to the booth to get information about your product and try it out. Many times, visitors come to the booth as a result of social media invitations to view demonstrations, not just endless loops of the company video. Some companies even offer interactive presentations via smartphones, which allows the attendees to play with the application long after the exhibitor has packed up and gone home. Booths might offer exciting games and contests, money blowing machines, and appealing giveaways in return for customers stopping by and giving up their contact information. Your display might be a conversation starters for some attendees, but just as in a retail store, others are “just looking” and don’t want a salesperson hovering around them. Some exhibitors have created small areas where people can view information uninterrupted and then seek out a booth representative if they had a question. These companies have found that this approach increased the level of engagement with people who were looking for information on their own timetable. Gone are the days when an exhibitor would measure the success of a tradeshow by the amount of literature they distributed, while the attendee measured the value of the tradeshow by the pound collected! Rather than distributing costly brochures, companies are adding QR codes to their displays that attendees can capture on their smartphone or tablet and be directed to a website with the information they want. The approach is greener, costs exhibitors less, and cuts down the amount of literature that overburdened visitors throw away at the trade show exit. Social media, both modern and green, allows marketers to do pre-show, in-show and post-show trade show marketing with a smaller trail of paper and minimal environmental impact. Your company can set up a page via your social media site that is a living piece of show history, which offers information about the show and your products, offers promotions, and allows for interaction with customers. Modern trade show displays are more visually appealing and engaging in a way that is comfortable to their tech savvy visitors.